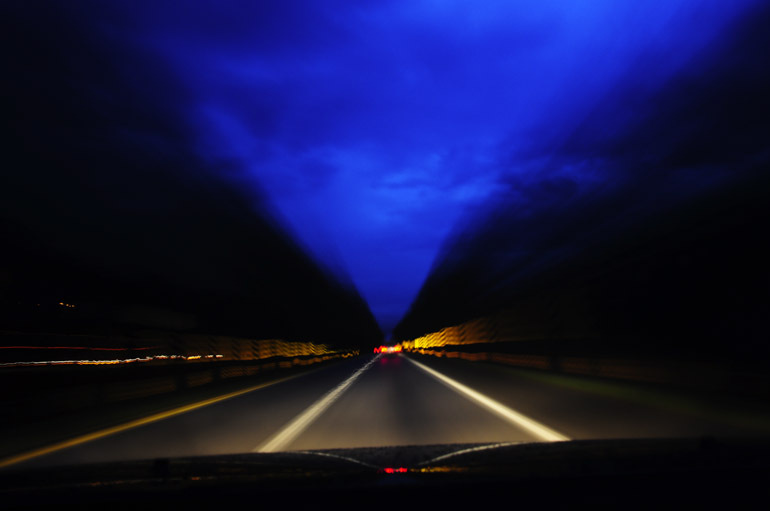 We start this post with a chase that began way behind schedule. 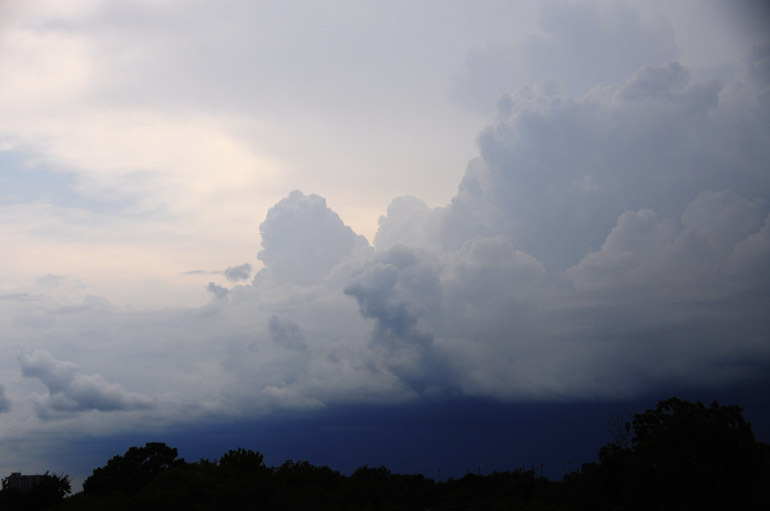 I had just arrived home when I realized a storm had popped up and was moving into the area I had just been. I grabbed my stuff -- or so I thought -- and left. I saw a nice gust front move northeastward as I raced to get in front of it along Interstate 526, an intended beltway that partially encircles Charleston. I took this shot by sticking my camera out my window at 70 mph and snapping away. Just happened to catch a bolt. I continued to play catchup and took this shot while I was at a stoplight. 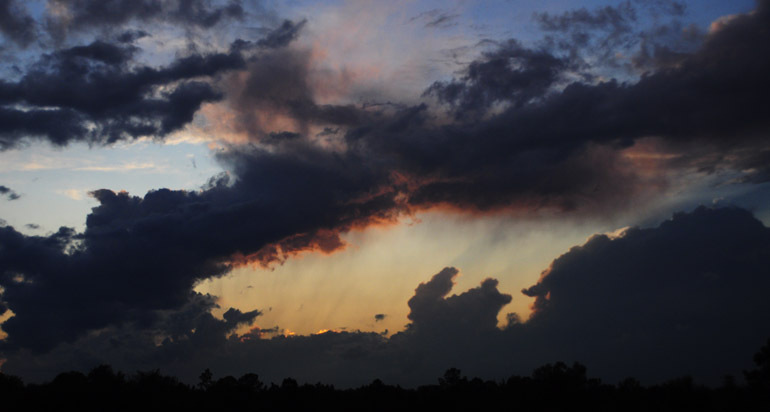 Some spectacular lightning was coming from these clouds, backdropped by a golden sunset. 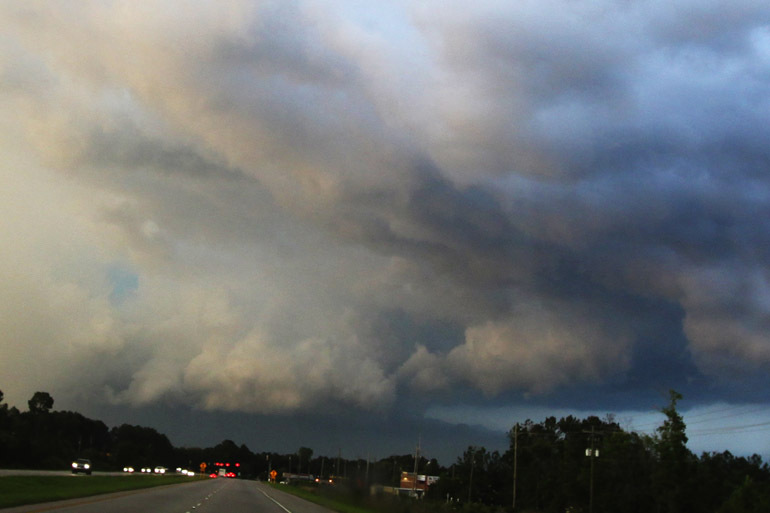 Another shot of the severe thunderstorm as I drove along North Rhett Avenue in North Charleston. 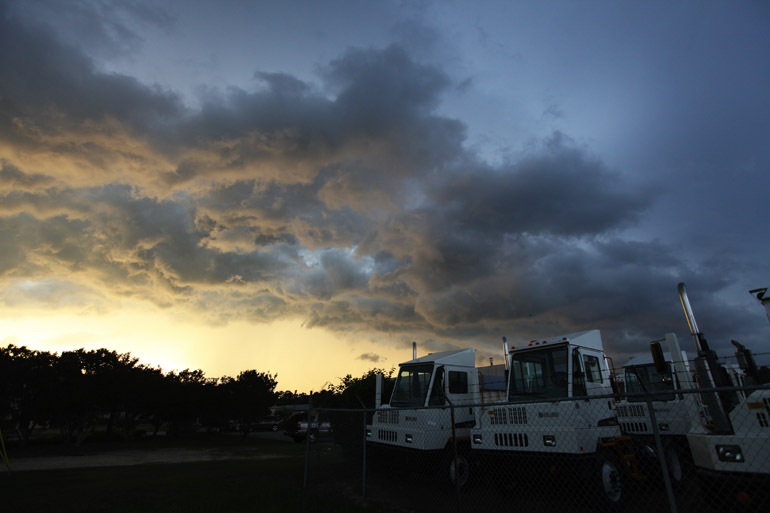 I decided that a shipping facility with heavy equipment was the best place to pull over and take some shots of the storm before it blew over me. The clouds were ragged and interesting when lit by the setting sun, but lightning wasn't frequent at this point, unfortunately. 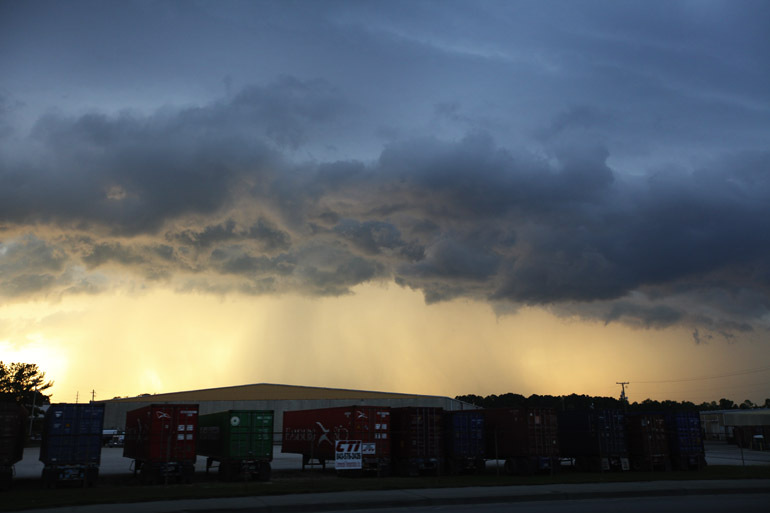 The sun began to shine through the light rainfall on the south side of the thunderstorm. I passed Hanahan, where I tried to snap a few pics of lightning striking an airplane, then drove here, to Goose Creek. 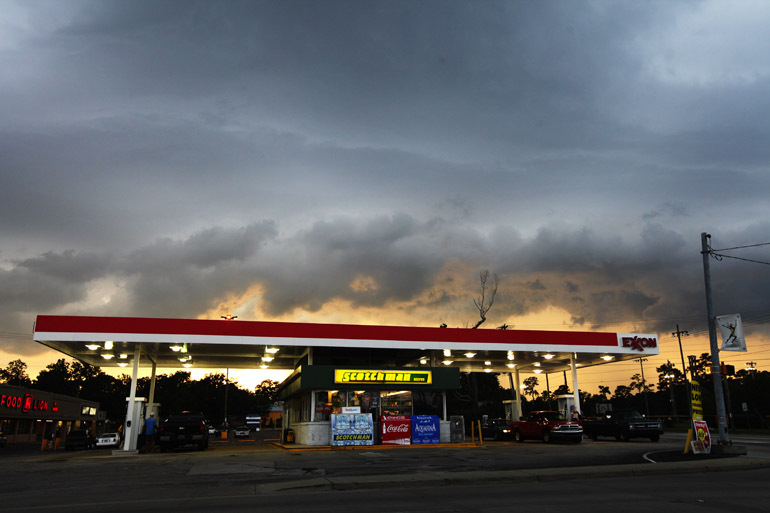 These low clouds seem consistent with a wall cloud, which is often a precursor to a tornado. Indeed, about 10 minutes later, a tornado warning was issued on this portion of the thunderstorm. 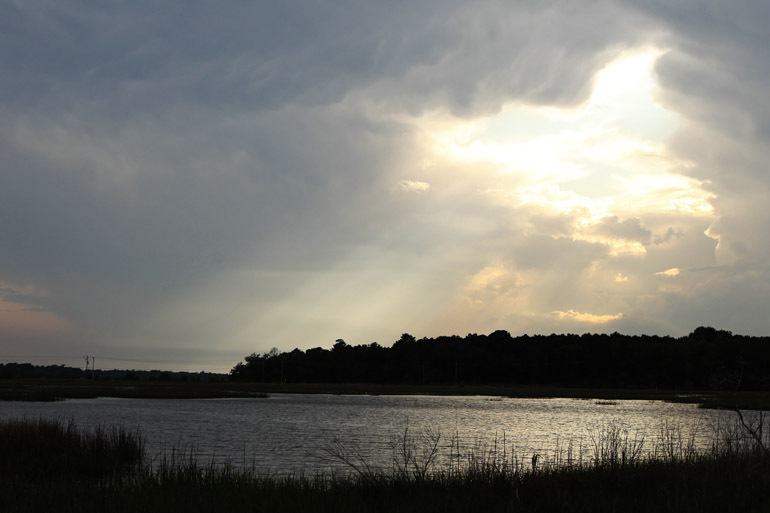 A funnel cloud was spotted and filmed in the Francis Marion National Forest, well to the northeast of this location. Unfortunately, I had to snap this with a wide-angle lens because I had forgotten a memory card for my Nikon, to which my telephoto was affixed. On an earlier day, I was in a community on Johns Island, reporting about a homicide that disrupted sleeping neighbors. En route back to the office, I saw sheriff's vehicles speeding to an unknown location. I followed them to this marina, where a man had been reported missing and was thought to have drowned. He lived on a boat here. 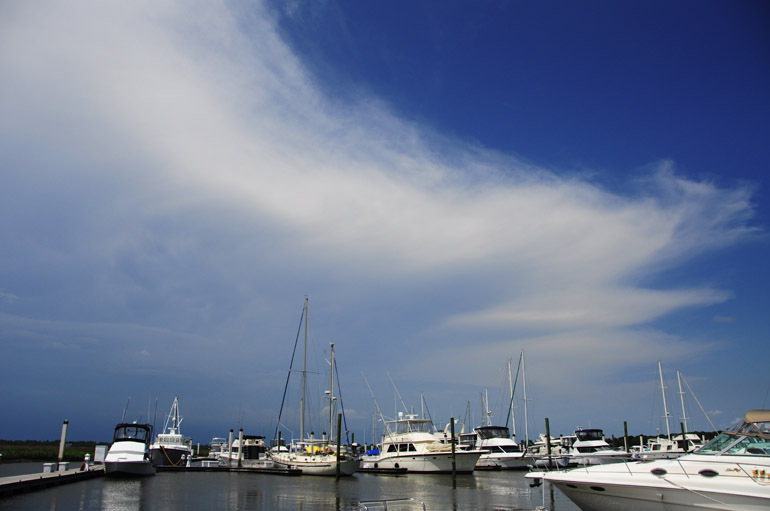 I was distracted by far-off clouds that were part of a severe thunderstorm well to the north of the St. Johns Yacht Club. 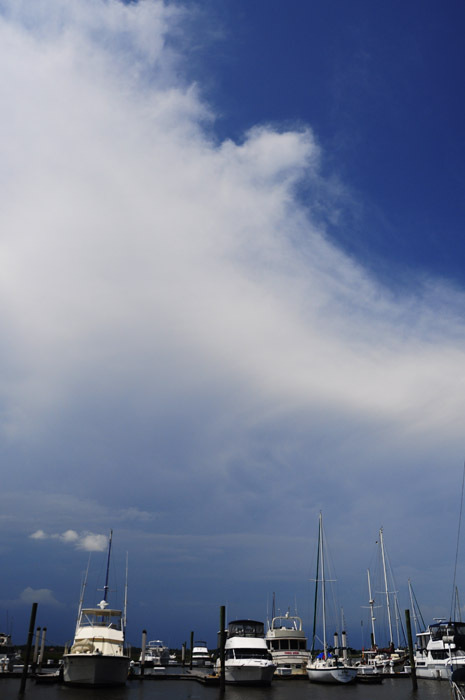 This was a rather large anvil cloud, and I could hear thunder in the distance. No lightning was apparent. 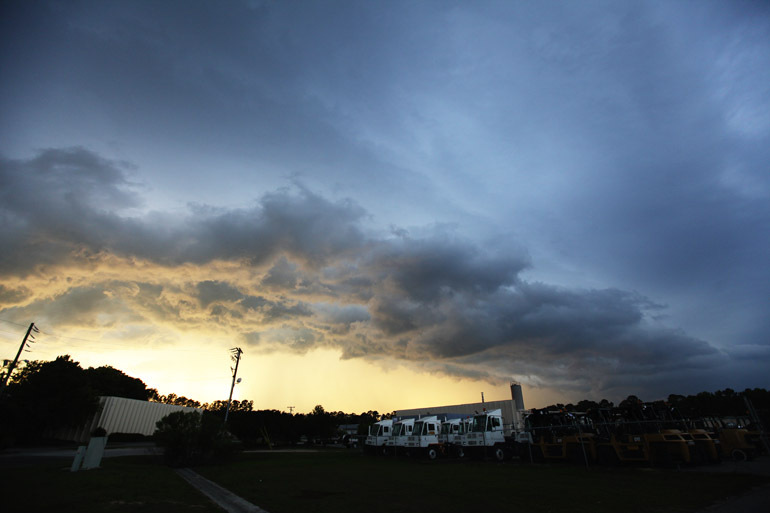 This was the faraway storm, which was pretty much stationary over Summerville, which is about 30 minutes north of Charleston. 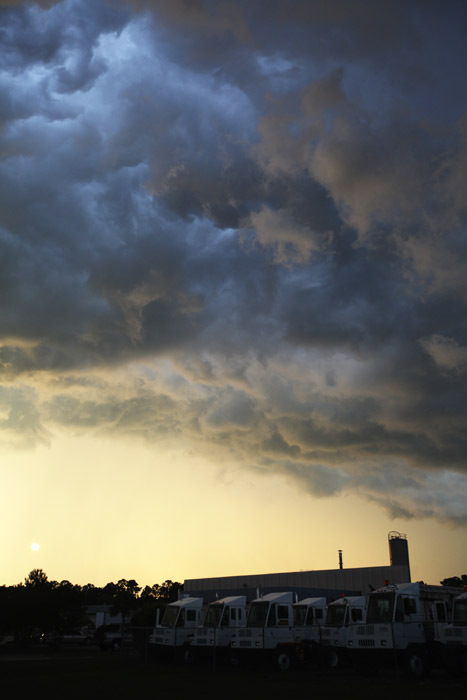 I took this shot from the roof of The Post and Courier building just before the storm fizzled out. On yet another day, I was driving home form West Virginia, where I visited my beautiful girlfriend, when I encountered some thunderstorms. 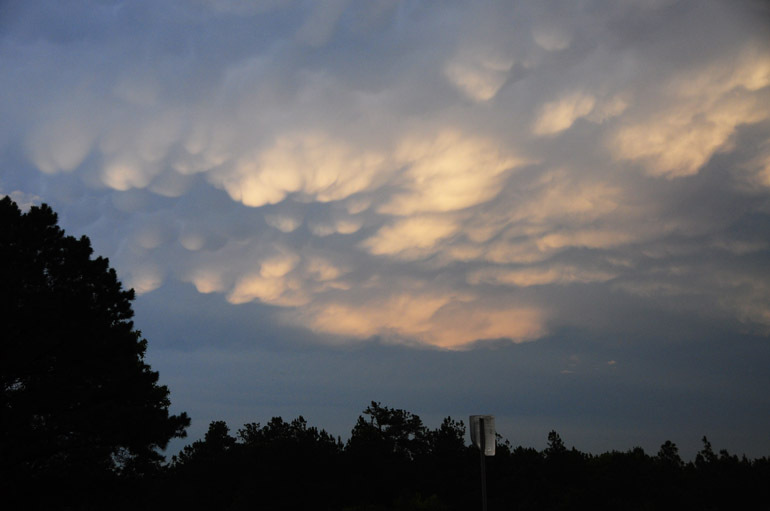 Above is a shot of a few mammatus clouds that I snapped after briefly exiting Interstate 26 just south of Columbia, S.C. I sort of liked this thin cloud on the opposite side of the sky from the thunderstorm. It was nearly sunset. 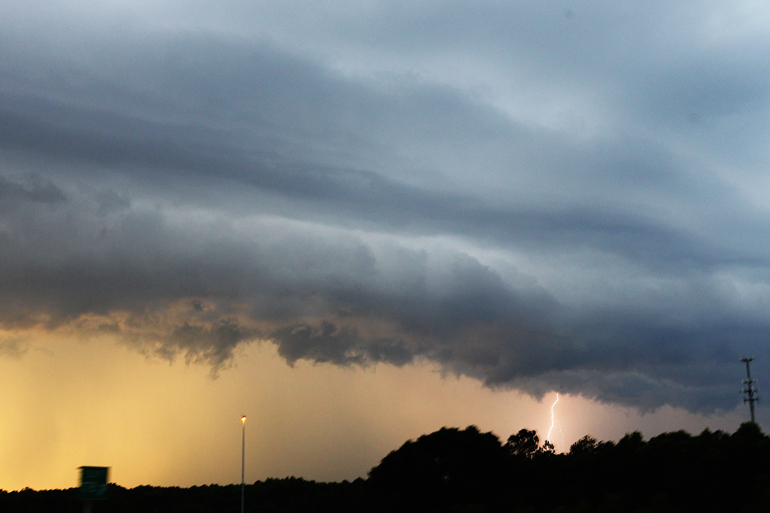 I tried taking photos of some spectacular lightning that I witnessed as I drove over the interstate. But all I got was some purple sky. On another day near Ravenel, a small community west of Charleston, I tried photographing some interesting cloud cover associated with a storm that was, again, well off to the north. I was expecting the storm to move into the area, but it died instead. 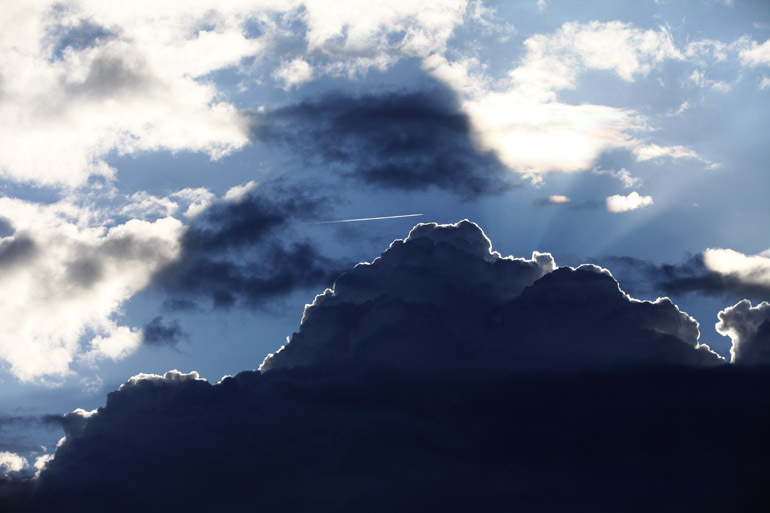 This is a shot of a "Jacob's ladder" as sunshine pierced the blanket of clouds. I went out for a run one day and parked my vehicle outside the area Home Depot. That's my starting point for a little route I do. And I happened to take a liking to the clouds, the sun behind them, the shadow they were casting and the jet streaking through all the crepuscular-ray goodness.